About Arco Ltd - Products, News and Contacts. 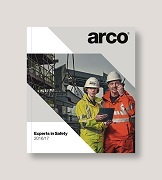 Arco, the UK’s leading safety company, has created a comprehensive product guide featuring their wide range of Lockout Tagout devices, padlocks and signs and how to use them to create a safer working environment. The new PPE Regulation to replace the pre-existing PPE Directive from the EU Parliament, Council and Commission, came into force on the 21st April 2016 and will apply to the entire Personal Protective Equipment (PPE) supply chain.